An Australian who climbed onto a dead whale as it floated offshore, attracting the attention of large sharks, apologised on Monday for his "idiot" act. An Australian who climbed onto a dead whale as it floated offshore, attracting the attention of large sharks, apologised on Monday for his "idiot" act. 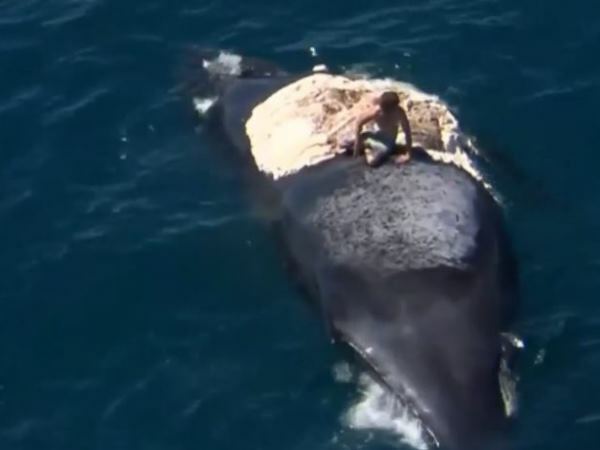 The man dived off a boat and climbed on the humpback, which appeared to have already been ravaged by sharks, south of Perth in Western Australia on Saturday. "(I was) out on the boat with the boys and one of my mates said it would be pretty funny if you go out surf the whale, so I did it," the 26-year-old, who wanted to be known only by his first name of Harrison, told Channel 7. After hauling himself onto the floating carcass, Harrison could see it was being circled by sharks, as his friends realised the danger and called for him to come back. "They were too busy chomping on the whale so it wasn't too bad," he said of the sharks which included a great white. But he said he would definitely not perform such a stunt again, admitting he could have lost his life. "I've done it, I don't need to do it again. Definitely it was a stupid act, didn't mean to disrespect anyone," he said. "Mum thinks I'm an idiot: dad's not too proud either." The whale has now washed up at Scarborough Beach, which has been closed because lifesavers spotted four large sharks in the area. Experts said the man's behaviour could have had dire consequences for him and anyone who had gone to his assistance. "It is very risky to enter the water around that type of large food source because even if you can't see sharks, it's highly likely the carcass is attracting them from a long way away," Tony Cappelluti from the Fisheries Department told The West Australian. "Irrespective of some type of adrenalin rush, or whatever you're trying to get out of performing that type of act, it's highly risky." Last month a young surfer lost parts of both arms in an attack off the south coast of Western Australia.